In July and October of 2008 I wrote two blog posts concerning the 1908 conditions of tenements in St. Louis as found in an 84 page report published by the Civic League of St. Louis. Several of my paternal ancestors lived in the vicinity around that time period. It occurred to me recently to ask, "What was the reaction to this report in 1908?" Through my local library card I have access to ProQuest's Historical Database for the St. Louis Post Dispatch (1879-1922), so I conducted a search and found the below two news articles which provide a nice summary of the report as well as some of the ideas the League had for correcting the situation. Only one bath tub for every 200 persons living within the 48 city blocks in the district bounded by Seventh and Fourteenth streets, Lucas Avenue and O’Fallon street, is what the Housing Committee of the Civic League found after a year’s study of conditions surrounding the poor in this tenement quarter. But 66 bath tubs were found in this entire district, which has a population of 13,225 persons. The report of the committee deals exhaustively with conditions in this district. It states that the residents live in cramped, filthy, and poorly ventilated houses. Many families live in but a single room. All of the foodstuffs prepared and sold in the district, such as bread, milk and ice cream, are full of dirt and impurities. These conditions destroy the vitality of the wage earners to such an extent that they do not work more than half of the time. Miss Charlotte Rumbold, under whose direction the report of the committee was prepared, has lived in the tenement quarter for 18[?] months to study conditions existing there. The plans of the league in remedy these conditions will be discussed at a meeting at the Jefferson Hotel Thursday night, at which Jacob [?] of New York will be the principal speaker. 1. The Health Department should be given power to close unfit houses. 2. Not more than 65[?] per cent of any lot should be permitted to be covered with buildings for residence purposes. 3. Lots should be required to be paved at least four feet from the walls of building. 5. Interior dark rooms should be forbidden, and window space should equal one-tenth of the floor area of a room. 6. At least 600 cubic feet per person of air space should be required in all sleeping rooms. 7. Fire escapes should be required on all tenements of three or more stories. 8. No new wall paper should be permitted to be put over old paper. 9. No new tenements should be used as dwelling and stable at the same time. Poor Housing and Lack of Garbage Facilities Endangers Health. An exhaustive report of housing conditions in the area lying between Seventh and Fourteenth streets, Lucas avenue and O’Fallon street, will be made at the annual dinner of the Civic League at the Jefferson Hotel Tuesday evening. An especially appointed committee investigated conditions in the area in question. Only one bathtub was found among 2479 persons who occupy 280 rear buildings as residences, in the 48 city blocks in the area investigated. There are only 66 bathtubs to a total population of 13,223 in the district. Only two fire escapes were found, although there are 380 buildings used for residences, more than three stories in height. In one case 16 persons were found sleeping and living in two rooms. In a number of cases six and seven occupants were living and sleeping in single rooms. There are 107 basement living rooms in the district. Halls were found to be seldom lighted at night and many stairways are rickety and dilapidated. Garbage and rubbish are mixed with dead rats, old mattresses, broken crockery and “a thousand other things,” dumped promiscuously in open wooden ash bins or leaking garbage receptacles. The report is a book of 84 pages and is illustrated with numerous photographs procured by the investigators. E.B. Miller, a graduate in sociology from the University of Missouri, did the detailed work, took the photographs and tabulated the results. Miss Charlotte Rumbold, secretary of the Public Recreation Commission, who has made a study of conditions in the district, wrote the report. The average monthly rental of a room in this district is $4.46, or about $1 per week. 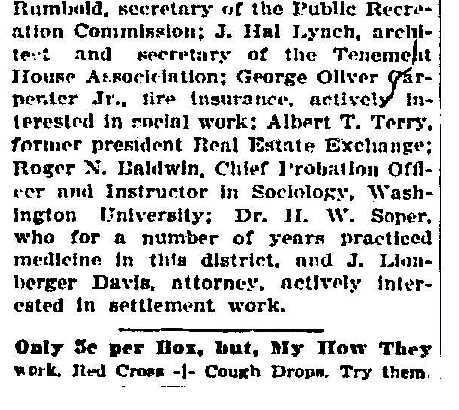 The members of the committee selected by the Executive Board of the league were: Earnest J. Russell (chairman), architect and vice-chairman of the Public Recreation Commission; Charlotte Rumbold, secretary of the Public Recreation Commission; J. Hal Lynch, architect and secretary of the Tenement House Association; George Oliver Carpenter Jr., fire insurance, actively interested in social work; Albert T. Terry, former president Real Estate Exchange; Roger N. Baldwin, Chief Probation Officer and Instructor in Sociology, Washington University; Dr. H.W. 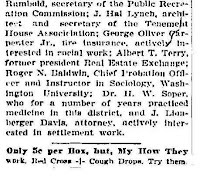 Soper, who for a number of years practiced medicine in this district, and J. Lionberger Davis, attorney, actively interested in settlement work. 1) All four sets of my paternal second great grandparents lived within or near to this neighborhood at some point. My second great grandfather, Selig Feinstein, and his family lived on the corner of 8th and Biddle between 1896 and 1906. My second great grandfather, Moshe Leyb Cruvant, and his family lived at 7th and Biddle in 1897. My second great grandfather, Morris Blatt, and his family lived at 10th and Biddle in 1896. All three of these addresses were within the boundaries of the study. In 1909 my second great grandfather, Samuel Newmark, and his family settled two blocks away from the area at Wash and 16th streets.